I may never buy hummus again. And after reading this, you may join me. Because once I (and thereby you) figured out how easy, cheap, and ridiculously delicious homemade hummus is, I decided to turn my back on the prefabricated stuff and am never looking back. That's it! I'm done. This summer, the LA Times ran a story about the best hummus in Los Angeles just weeks after a similar story ran in the New York Times. But what made the LA Times article stand out was its inclusion of Paula Wolfert's recipe for the homemade stuff at the end. Wolfert, one of the goddesses of Middle Eastern cooking, is another kitchen heroine of mine, but it took me a while to actually make her recipe. It's seriously high-yield, producing 4 whole cups worth of hummus. Even if it would prove to be the best version in the world, how would I ever polish off that much? Well, it turns out that a birthday party is a pretty good place to answer this question, as you'll have at least 20 people avidly digging in to the hummus plate and yet you'll find, after they've all gone home and you are dejectedly cleaning up and thinking that this year's birthday was even better than the last, that you still have some left over. Which, actually, is just fine as these kinds of leftovers are the good kind and after all, how better to end a birthday week than with a smear of hummus on a second loaf of the No-Knead bread? Which, by the way, I baked in my 4-quart oval Le Creuset, thereby discovering that it's the perfect size and shape for this loaf. You soak a bunch of dried chickpeas overnight (I bought a bag of roasted, dried chickpeas at BuonItalia, just because they looked...nuttier than the regular ones, but who knows if that made a difference), then simmer them in salted water until they're soft. In the meantime, you make a paste out of salt and garlic, then whizz that in a food processor along with sesame seed paste and what seems like an inordinate amount of lemon juice. Trust the recipe, though! Wolfert says the mixture should look "contracted", which meant nothing to me, but I stopped when it looked like this and that turned out to be fine. Then you add the drained chickpeas and process the mixture until an improbably creamy mass starts to form. Depending on how loose you like your hummus, you can add cooking liquid and lemon juice. It keeps in the fridge for a few days, though you'll have to add some more water and lemon juice to loosen it up a bit (and let it come to room temperature, because the flavors totally bloom then). I sprinkled mine with paprika and drizzled it with one of the delicious oils in my Alejandro & Martin sampler. A more appetizing plate of hummus I never did see. And the taste! Fresh and creamy, with a nutty flavor and grassy notes from the oil. The hummus had heft, but was also airy from all the processing. I'm telling you - after you make it, you'll never want storebought hummus again. I'm so glad I tried this recipe. It's like a birthday present from Paula herself. Thanks, Paula! 1. Rinse the soaked chickpeas well and drain them before putting them in a saucepan and covering them with plenty of fresh water. Bring to a boil; skim, add one-half teaspoon salt, cover and cook over medium heat, about 1 1/2 hours, until the chickpeas are very soft (you might need to add more water). 2. Meanwhile, crush the garlic and one-half teaspoon salt in a mortar until pureed. Transfer the puree to the work bowl of a food processor, add the sesame seed paste and lemon juice and process until white and contracted. Add one-half cup water and process until completely smooth. 3. Drain the chickpeas, reserving their cooking liquid. Add the chickpeas to the sesame paste mixture and process until well-blended. For a smoother texture, press the mixture through the fine blade of a food mill. Thin to desired consistency with reserved chickpea liquid. Adjust the seasoning with salt and lemon juice. 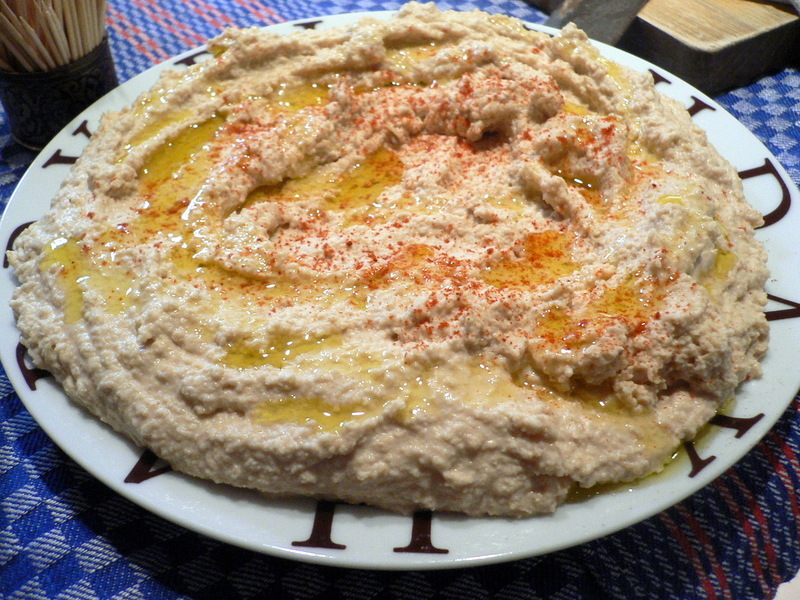 The hummus can be kept in an airtight container in the fridge for up to a week.) Serve, sprinkled with paprika and parsley and drizzled with oil.